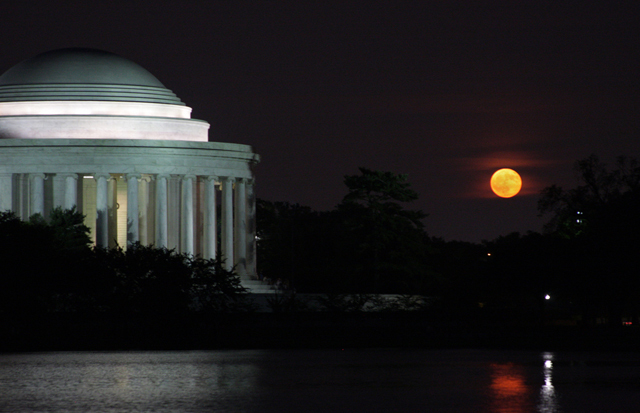 The moon was full and it rose just beside the Jefferson Memorial. How cool was that!! The hazy humid conditions are what gave the moon it's rich color. Hey, nice, Scott! I'm still playing around with mine, trying to find a good composition. But you nailed it. You also did great at getting some detail in the moon even that low in the haze. Beautiful... Such a magnificent scene - and you captured it well. Nicely done! What a treat to shoot with J. Levy, no? Looks good. You've got nice detail even in the water. Proudly hosted by Sargasso Networks. Current Server Time: 04/19/2019 12:40:31 PM EDT.